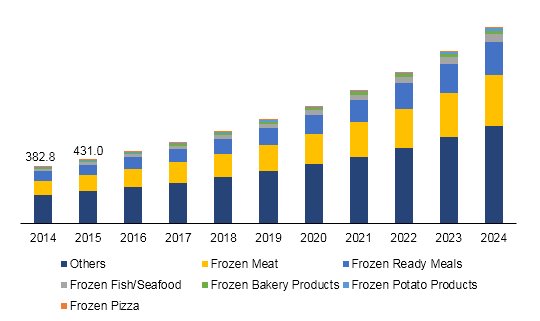 04 January 2019, India Frozen Food Market is expected to be valued at $1,322.3 million by 2024. India is the second largest food producer in the world straight after China. Despite strong agriculture production base, a noteworthy amount of food produced gets wasted owing to poor storage and inadequate infrastructure in country. 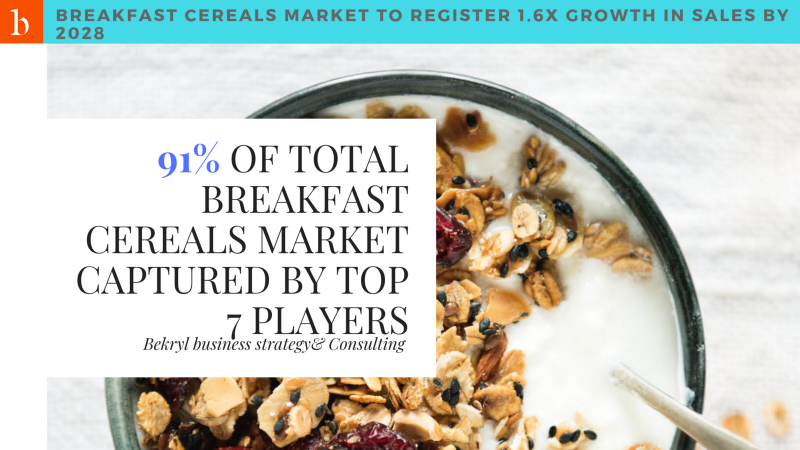 Hence, frozen processed food products with longer shelf life and easy preparation than traditional food products, are expected to be booming and hence, bring new players in the market to serve the rising requirement with adequate and sustainable infrastructure. India being the tropical country, vast amount of post-harvest losses of vegetable and fruits takes place every year and therefore, frozen convenience food is expected to solve the problem over the coming years. The Indian industry comprises of heat-and-eat vegetarian, ready-to-cook, fry, and non-vegetarian food products, and is chiefly dominated by some regional players and select national brands. However, the frozen food market in India is at a nascent stage owing to low awareness, few products, lack of refrigeration equipment, and underdeveloped cold chain network. The paucity of time along with growing urbanization, lots of Indians are preferring western dishes over traditional food products. The population of working women and young professional teenagers living alone is increasing the demand. 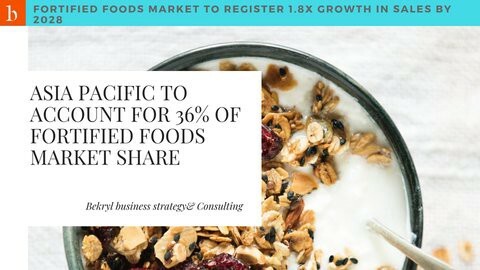 Increased shelf life, good visibility, a variety of frozen food products, and offering free samples in food markets is expected to provide further exposure to these products in country over the coming years. Regardless of the variety of offerings and expected promising growth, the frozen food industry in India is at nascent stage however, companies are focusing on finding out more promising freezing process which will reduce the production time and will help in increasing the volume in minimum time. Lack of necessary back-end infrastructure is causing delays and failures in delivery of frozen food products from the manufacturer to retailers and also is expected to hamper the quality of the products. Mother Dairy Fruits & Vegetables Pvt Ltd.
26 October 2018, The Flexible AC Transmission System (FACTS) Market size is expected to grow moderately over the forecast period. Surging demand for industrial and renewable energy applications along with general electrical utility is projected to drive the market. Large-scale technological developments and restructuring activities of existing power infrastructures across the globe are likely to bolster the growth of the market. Transformation of smart grids offers numerous opportunities in the market. The technology is developing at a significant rate, with the continuous emergence of new applications across different industry sectors. Development of high-powered electronics systems is expected to drive the market further. FACTS technologies have a minimal impact on the environment and a small footprint. Project implementation times for such advanced power infrastructure are considerably lower along with lower investment costs than alternative of building more transmission lines or new power generation facilities. FACTS provide features such as higher flexibility and reliability for existing power infrastructure systems. Static VAR Compensator (SVC) is extensively used in FACTS, followed by Fixed Series Capacitors (FSC) along with devices such as Static Synchronous Compensator (STATCOM), Unified Power Flow Controller (UPSC), and Interline Power Flow Controller (IPFC) required for power grids. Improved control over voltage and power supply, reduced power loss during transmission, and improved power quality are some of the benefits of these systems. Such systems have the potential to enhance power system operation and increase import power capacities of the existing systems. It also provides load flow control in meshed systems, fast voltage regulation, and damping of active power oscillations. Incorporation of renewable sources and evolution to smart grid by different countries provides an opportunity for the market across the globe. Around 60 countries across the world have upcoming renewable energy policies that make it mandatory for the energy retailers to specify the portions of their source of energy to renewable energies. Environmental effects, impact on public health, and regulations regarding land usage are the fundamental challenges faced by the the market. The cost of replacing and installing new FACT system is relatively high in comparison with the traditional transmission system. Moreover, lack of awareness about the benefits of these systems is anticipated to restrict the market growth. Railways, electrical utilities, steel, and oil and gas sectors are the major end-users of FACTS. The Flexible AC Transmission System (FACTS) market can be segmented on the basis of compensation type as series compensation, shunt compensation, and combined series and shunt compensation. Power electronic devices, reactors, thyristors, GIS switchgear, capacitor banks, Phase Shifting Transformers (PST), surge arresters, and protection and control systems are the major FACTS components. Thyristor Protected Series Compensation (TPSC) and the Short-Circuit Current Limiter (SCCL) are the recent developments in the market. The Asia Pacific regional market is expected to lead the FACTS industry on account of increased demand for power transmission solution, voltage and power infrastructure in countries such as India and China. Moreover, the market for such technology in South East Asian countries such as Singapore, Malaysia, Indonesia, and Australia is expected to grow at a steady rate over the forecast period. North America regional market led the global industry in the past acquiring a significant share of the market. Rising replacement and developments of the existing power infrastructures, along with integrating renewable sources in the power grids, in developed economies such as North America and Europe is expected to drive the regional industry over the next few years. Led by the demand from countries such as Germany, U.K., Spain, and Italy, the Europe regional market also accounted for a significant share of the market in the past. Key companies in the global FACTS market include ABB Group, Adani Power Ltd., American Electric Power, Alstom, Siemens AG, Xian Electric Engineering Co. Ltd., and Toshiba Corp. Eaton Corporation recently acquired electrical equipment supplier Cooper Industries to form a new premier global power management company aimed at easier entry into the power infrastructure sector. The industry has been witnessing extensive mergers and acquisitions to make their mark in the market.